One of our many Christmas traditions is making homemade ornaments with the kids every year. I love filling our tree with all their homemade ornaments. The kids beam with pride when they see their ornaments hanging from the tree. 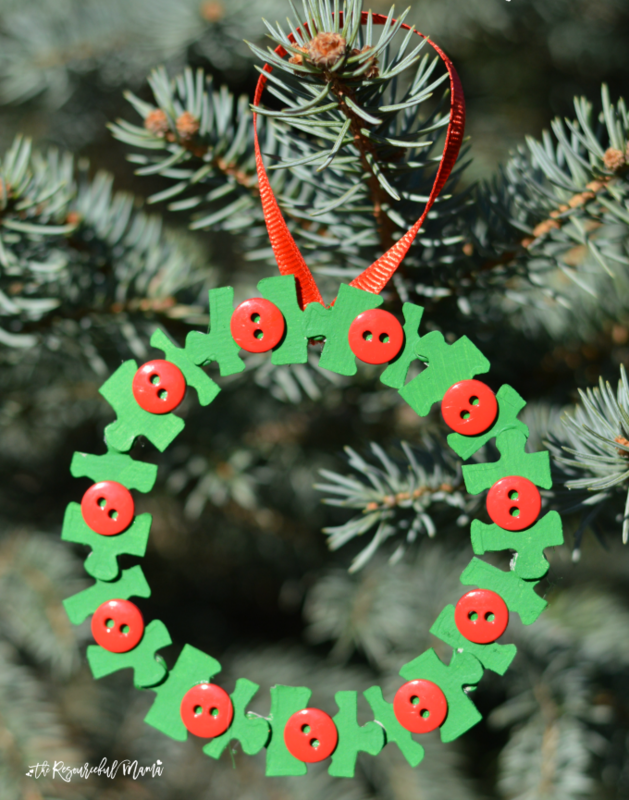 This Puzzle Pieces Wreath Ornament was inspired by a Christmas puzzle I picked up a thrift store a year ago. At the time I had no idea how I would use it, but knew we would transform it into something fun. 1. Glue puzzle pieces together to form a wreath, slightly overlapping each piece. I prepped this step ahead of time using a glue gun. Our kids have an ultra low temp glue gun they love and could have done this step with some assistance on forming the wreath. 2. Paint wreath ornament green. The kids used sponge brushes and dabbed the paint on rather than using brush strokes. Allow to dry. 3. Glue red buttons onto the wreath ornament. 4. Cut a small piece or red ribbon, forma loop, and glue to the back of the ornament as a hanger for the wreath ornament. 5. Hang from your Christmas tree.